Giant galaxies that no longer form stars have 100 times more gas than expected. By succeeding for the first time to analyze the light of nearly 1000 very distant elliptical galaxies, more than 10 billions light-years away, a team of researchers including three astrophysicists from the Astrophysics Department of CEA-Irfu has just revealed that these galaxies of the beginning of the universe contain a lot of gas but do not form stars. A real enigma that challenges our understanding of the evolution of these giant galaxies. These results are published in the journal Nature Astronomy of January 16, 2018. Galaxies exist in two main types: disk and elliptical. Disk galaxies, such as our galaxy, the Milky Way, are flat and contain large reservoirs of gas that they use to continually form stars. On the contrary, elliptic galaxies are massive, of spherical form, and stopped forming stars a long time ago. Most theories assume that, at some point, elliptical galaxies have lost their gas reservoirs, which has reduced the rate of star formation. To test this hypothesis based on the nearest galaxies, the researchers sought to know if this was the same for the most distant elliptical galaxies, those we still see at the beginning of their evolution. Their goal was to measure the amount of gas contained in these young galaxies. For this, they used infrared and radio wave observations, which measure both the rate of star formation and the cold dust mass that reveals gas in galaxies. 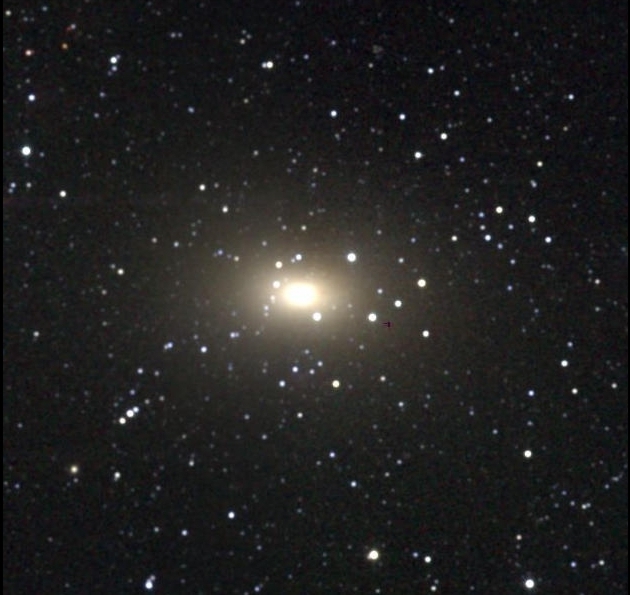 Maffei 1 is a giant elliptical galaxy in the constellation Cassiopeia, about 10 million light-years away. 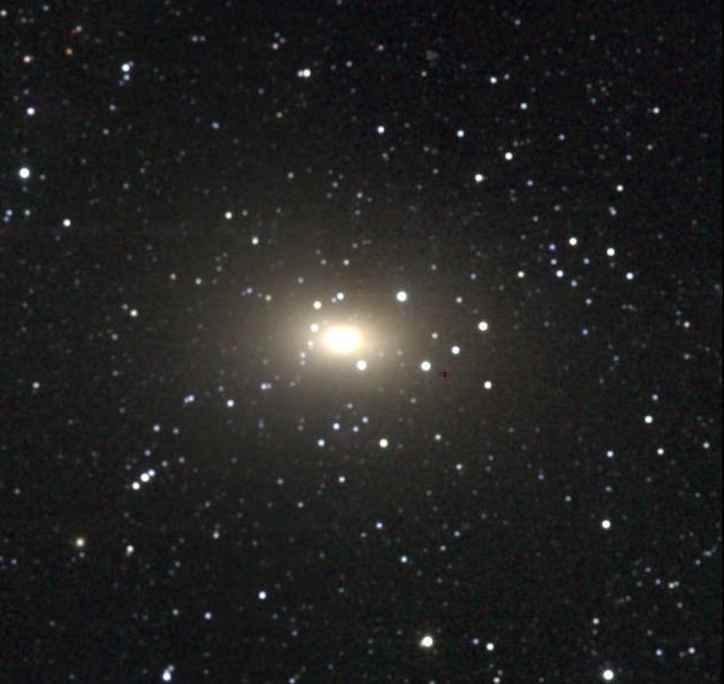 It is the giant elliptical galaxy closest to the Milky Way. It is considered to have little gas unlike the discovered distant elliptical galaxies that show significant gas reserves. Copyright : 2MASS/UMass/IPAC-Caltech/NASA/NSF. Unfortunately, for such distant objects, it is still impossible to have precise measurements for each galaxy individually. Researchers circumvented this difficulty by combining the light of nearly 1,000 galaxies to determine how much gas they contain on average and how fast they form stars. For this, they used the measurements of a deep survey called COSMOS (for Cosmic Evolution Survey). 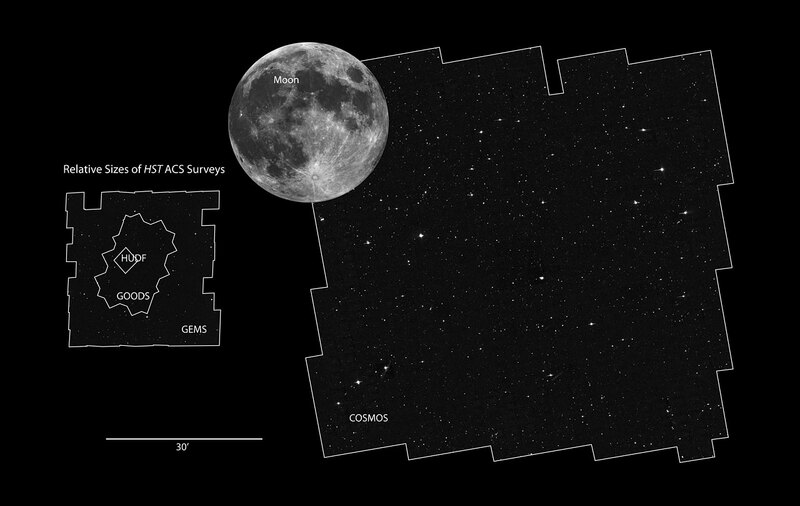 This survey, initiated in 2003, analyzes in depth a region of the sky two square degrees (about 16 times the surface of the full moon) using many different telescopes on the ground and in space. It involves more than 100 scientists from different countries. This study has led to an amazing discovery. Despite their low rate of star formation, distant elliptical galaxies contain surprisingly large amounts of gas: 100 times more than expected. This is surprising in two ways. First, it challenges our standard view of elliptic galaxies as gas-poor and relatively inefficient objects. But it also forces us to rethink the basic view of star formation processes. It has always been assumed until now that the presence of cold gas should lead to the formation of stars. Here, we find that, despite a large amount of gas, elliptical galaxies form stars much less efficiently than disk galaxies at the same epoch. For the moment, there are very few ways to explain this paradox. Some numerical simulations show, for example, that in disk galaxies like our Milky Way, the gravitational attraction of the stars helps the gas to collapse to form new stars. In contrast, gas in elliptical galaxies feels a lower attraction from the stars and does not collapse so easily. It is impressive that the global morphology of a galaxy can control what happens in much smaller and more localized areas where stars are formed. To confirm this result, the researchers will develop other simulations and will seek to detect this gas directly thanks to the great radio interferometer ALMA (Atacama Large Millimeter / submillimeter Array), now operational on the peaks of Chile at 5200 m altitude. "The unexpectedly large dust and gas content of quiescent galaxies at z > 1.4"